When two major industries have a large common growth challenge, a major innovation platform arises. Increased urbanization, greatly improved vehicle fuel efficiency, and environmental concerns are decreasing the demand for fossil fueled automobiles. Energy efficiency measures and alternative energy investments are decreasing worldwide electricity utility revenue. The common opportunity that addresses both the utility industry and the auto industry's needs and challenges is an increased amount of electric vehicles (EV). However, to effectuate the massive conversion of fossil fuel vehicles to electric vehicles, a wave of new and innovative products and processes is required. These new and improved products and processes can be supported by federal Research & Development tax credits. Eligible costs include employee wages, cost of supplies, cost of testing, contract research expenses, and costs associated with developing a patent. On January 2, 2013, President Obama signed the bill extending the R&D Tax Credit for 2012 and 2013 tax years. BMW is one of the first major auto manufacturers to study the impact of urbanization on the future of the auto industry. In an effort to create environmentally friendly car technologies and assist with transportation challenges, BMW engaged in research efforts with battery manufacturers and utilities, concluding that electric vehicles were the key to developments within highly urbanized areas. In 2011, BMW introduced their electric vehicle, the BMW i.
BMW also partnered with the global rental car company, Sixt, to develop a car-sharing service for highly populated cities. Gaining an estimated 10,000 new customers a month, DriveNow is a service that allows drivers to rent a vehicle for a short period of time and pick up and return at designated spots. The car-sharing concept paired with BWM's high-end electric vehicles offers a sustainable option that is particularly beneficial in densely populated areas. In addition to DriveNow, BMW offers ParkNow, a parking spot reservation service, and ChargePoint, an electric car charging service. These BMW ventures focus on the global urbanization trends with the first roll out of BMW electric cars targeted for specific cities. BMW's November 2013 financial presentation identifies China's largest cities by population. Charging methods is a key aspect in the developing electric car market. CHAdeMO is a quick charging technology for electric vehicles that can deliver up to 62.5 kW of direct, high-voltage and charge low-range vehicles in less than thirty minutes. Electronic vehicle manufacturers including Nissan, Mitsubishi, Subaru, and Toyota are all compatible with the CHAdeMO technology and have charging stations throughout the world equipped with CHAdeMO. The Nissan DC Quick Charger can charge a fully depleted Nissan LEAF to 80% power in thirty minutes. Creating a convenient charging technology for drivers plays a significant role in the growth of the EV sector and the conversion from fossil fuels. Europe's major electric utilities are experiencing alarming continuous revenue declines that have plunged virtually the entire European utility industry into an economic downturn. The same causal effects of increased energy-efficient products such as LED lighting and alternative energy are occurring in the United States. Some U.S utilities are beginning to experience flat revenues at a time when many of them need to make large capital upgrades to meet EPA emission requirements. Accordingly, U.S utilities could greatly benefit from a new revenue source. The critical business driver for most utilities is to ensure that they have enough generation resources to meet "peak demand", the highest customer demand level which occurs in the daytime. The economic advantage with electric cars is that for the most part, they can be recharged at night when overall customer electricity demand is low. This means that utilities can use the same power plant assets while generating a new revenue stream. This is also a win/win for the consumer since many utilities offer lower electricity prices at night. With the number of EVs expected to reach 1 million by 2020, the U.S. utilities need to define other technologies to ease the implications. The biggest technological hurdle remains long-range battery life. Consumers state that their biggest reservation is so-called "range fear" a fear that they will be out of range of a recharging station and become stranded. One of the most exciting opportunities with electric battery charging is two-way electric flow or bi-directional flow. With this approach, a home or the grid could utilize the battery reserve when needed. The vehicle to grid or V2G process is an opportunity in which electronic vehicles absorb power from the grid and return it when it is needed. There is also the idea of EVs interacting with the grid in short-term intervals of a few seconds. This would provide the quick power absorption and energy storage the grid needs. The V2G process could also help when the grid is in danger of shutting down by absorbing power from electric vehicles. In terms of equipment, electric cars typically have an electric motor in place of a traditional gasoline engine. The electric motor is battery powered through the controller component. The EV mechanics differ greatly from gasoline powered vehicles in that they also do not require fuel lines, exhaust pipes, coolant hoses, mufflers, catalytic converter, etc. Compared to a gasoline engine which is more of a plumbing concept, an electric vehicle is more of a wiring centered project. Electric Vehicles introduce new systems such as gear boxes, electric power steering, water pumps to cool the electric engine, battery packs, and cell components. These new systems and designs require major research and development as the EV market continues to evolve. Figure 2: How Do Gasoline and Electric Vehicles Compare? Vehicle surfaces can also be used to help recharge batteries. By integrating solar panels on the roofs and other surfaces, electronic vehicles can further create efficiency in the market. Ford unveiled its concept for their electric car outfitted with solar panels at the 2014 Consumer Electronics Show. The Ford C-Max Energi's roof would be equipped with 5 square feet of solar panels, which can power up to 75% of a typical driver's needs. The solar paneled C-Max Energi will perform the same as the C-Max plug-in hybrid by utilizing a day's worth of sunlight. PlugShare app allows users to locate residential, public, and high power charging stations as well as plan a travel trip. ChargePoint, Inc. allows you to map the 16,000 ChargePoint charging stations and their real-time availability. R&D tax incentives are available to companies further developing mobile apps for EV users. As the Tesla electric vehicles continute to develop in the market, Tesla expands its efforts to include creating charging networks. In 2014, Tesla announced the completion of their nationwide supercharging network. The network spans from Connecticut, down the East Coast, across middle America to Los Angeles, and then up the West Coast to Vancouver. The free Tesla charging stations now create a very accessible route for Tesla EVs to travel from coast to coast. Tesla recently filed a patent for the "Multiport Vehicle DC Charging System" which would allow stations to prioritize multiple EV charging based on need and arrival time. Also recently patented, Tesla's hybrid EV battery with 400 mile capability. Innovation in EV batteries and charging technology can lead to a major expansion of the EV market and these efforts may qualify for R&D tax credits. 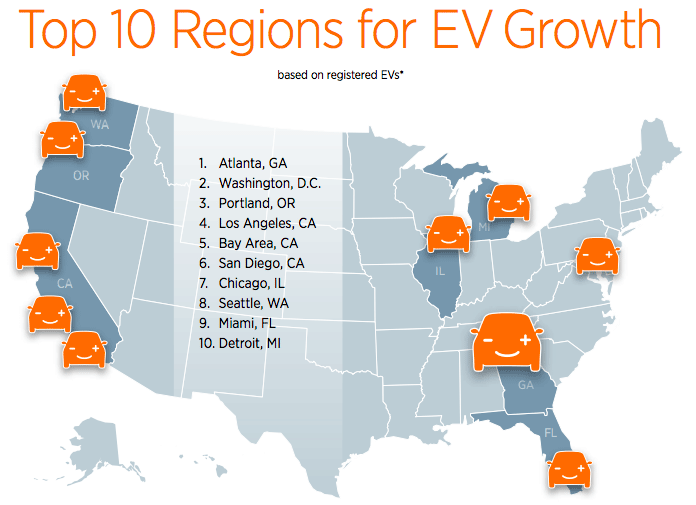 Utilities across the country are implementing electric vehicle initiatives to jumpstart and support the growth of the market. Fortune 250 company Duke Energy, headquartered in Charlotte, NC, has pledged that by 2020, new vehicle purchases will be plug-in electric vehicles. Duke is also working with EV industry leaders to research, test, and deploy charging stations. In 2013, PESG opened the largest New Jersey electric car charging station at their Newark, NJ headquarters. The initiative provides free EV charging at the 13 plug-in stations and free garage parking (which can be around $600 a year). Portland General Electric, headquartered in Portland, OR, has joined forces with Portland State University for research, economic development, community projects, and training. PGE also helped in the selection of Oregon for the DOE funded 'EV Project' which will place charging stations throughout the Portland metro area. Electric vehicle makers and utilities alike are working to prime the market for upcoming environmental and economic changes. Both sectors share a common connection and new developments in both markets are underway. Research and development activities, particularly assisting the conversion from fossil fuels to electric vehicles may qualify for federal R&D tax incentives. Andrea Albanese is a Project Manager with R&D Tax Savers. Raymond Kumar is a CPA and Tax Manager with R&D Tax Savers.